As Thanksgiving rolls around, the conversation ultimately centers on how thankful we are. As parents, we use this time of year as a stepping stone to one of those “teachable moments”. Each year we feel obligated to remind our kids of all the things that they should be thankful for. This is a good thing, and by all means- keep it up! But instead of more stories of Pilgrims, turkeys, and abundant harvests, why don’t you use this year as an opportunity to let your children show someone else how thankful they are? It’s simple. Download and print the attached Thanksgiving Thank You notes. (There are four to a page, so you’ll need to cut it into 1/4’s as indicated.) 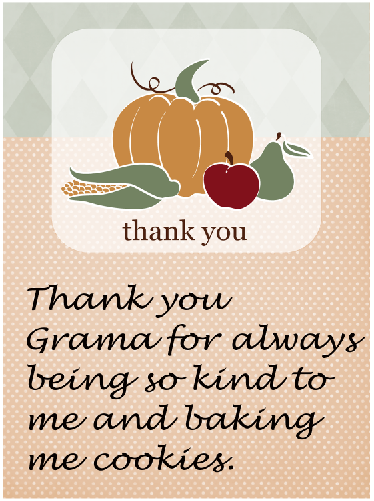 On each 1/4 sheet, have your child write why they are thankful that so-and-so is a part of their life. Have them do this for each guest you are having dinner with or for anyone important in their lives. This simple exercise forces children to think about each person individually and brings to their conscious the reasons why that person is special to them. Let me tell you something from experience. Being the recipient of such a thoughtful sentiment is more meaningful than turkey, stuffing, and stories of pilgrims. It’s a true blessing to be thankful for that will last the whole year through. Click here to download your Thanksgiving Thank You notes.